Each year, more and more Goshen High School students are graduating better prepared and ready to take on college courses because of the International Baccalaureate (IB) program. The IB diploma program is a curriculum used around the world that asks students to complete IB-level courses in English, a second language, math, science, social studies and an elective, including music or art. Students working towards earning the full diploma must also complete a minimum of 150 hours in “creativity, action and service activities” through extra-curricular, community service or other such activities, a 4,000-word original research essay and the Theory of Knowledge course. Students not pursuing a full diploma can also take IB courses. The classes themselves are also structured in such a way that encourages more independent thought in students and asks them to develop and follow-up on their own creative projects. “It’s really about thinking,” said GHS Principal Barry Younghans. The classes may be more intense, but if students pass the corresponding IB exams, they can earn college credit. Full IB diploma candidates can earn up to one year of college credit at certain universities, but Younghans said that, credit aside, the courses prepare students more than traditional classes. Younghans explained how, unlike traditional classes that focus on the repetitive practice of concepts, IB really works to have students learn concepts more in-depth and to pull in concepts from other disciplines that the name of that particular class. Students are much more independent in their learning in IB classes. Younghans gave the example of students creating their own science laboratory experiment, creating the hypothesis, working through the experiment and writing a report on what happened, even if the experiment failed. That’s different than in typical high school sciences classes, and even many college science classes, where students would just replicate an experiment given to them, he said. The past several weeks, the students in Todd Kirkton’s IB math class have been working on math research papers. Students had to choose a general topic they were interested in, then somehow relate math to that subject. By leaving the assignment so open-ended, students have had to pull from several different mathematical areas — statistical probability, algebra, geometry, calculus, rather than just one area like more typical high school courses would do. One student in Kirkton’s class used his interest in baseball to look at the amount of home runs and the true distance of hits through the professional season. He found that power hitters actually become less successful through the season, while pitchers are becoming more successful by throwing more accurately and hitting at their desired elevation angle. Another student said he’s known how to solve a Rubic’s Cube for quite a while, but didn’t really know exactly how he was solving it. In his paper, the student talks about how doing sets of moves, called algorithms, can return the Rubic’s Cube to its solid-colored sides and how to use those algorithms to predict how many moves it could take to finish the cube. 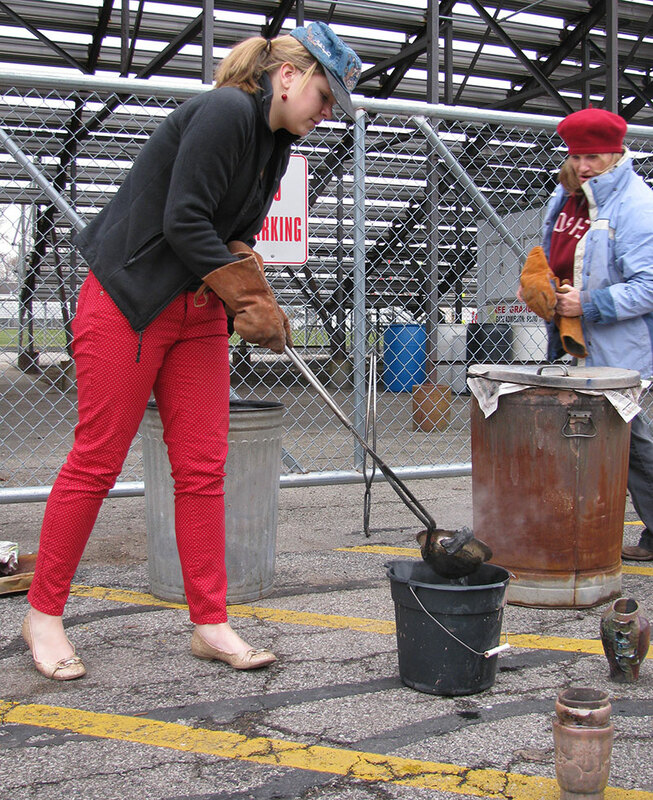 Last week, a Goshen High School IB art student was able to do her first raku firing — a Japanese process of firing ceramic pots. In the process, pots are fired until they are glowing red hot in a kiln, then quickly removed and placed in the ground or in a container surrounded by newspapers, straw or other such materials. 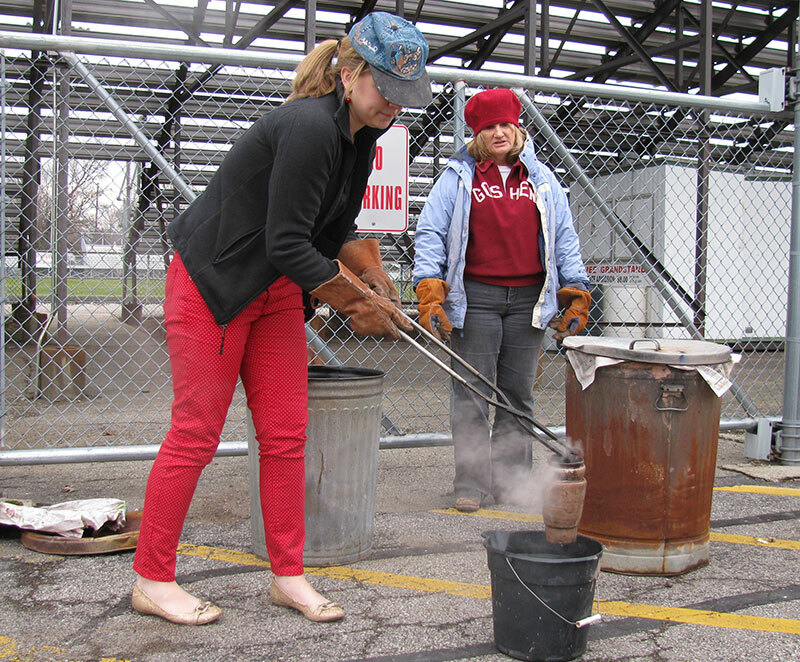 Art teacher Cindy Cooper noted that the student had not only studied the process but the Japanese tea ceremony that includes raku pieces, the history of raku and more. 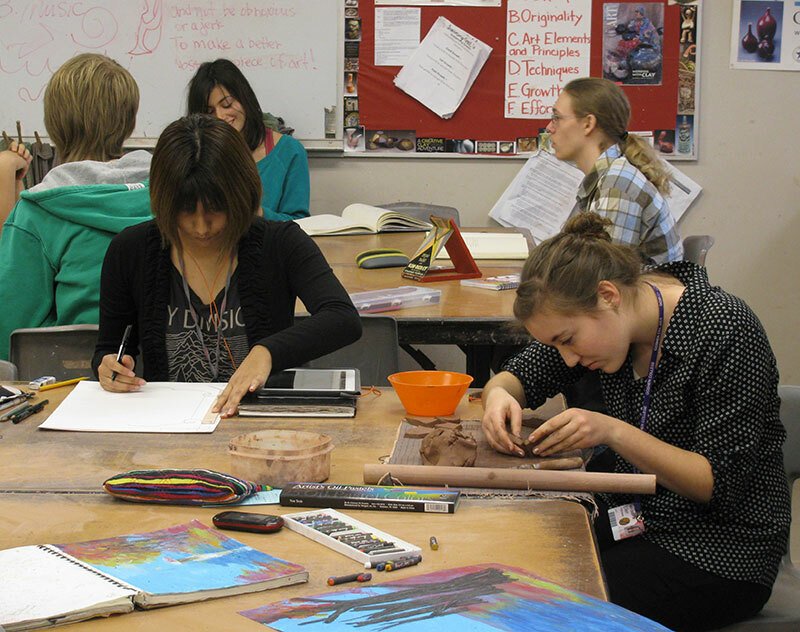 Students work on projects in Cindy Cooper’s Ib art class. Kirkton and Cooper both pointed out the creativity that IB classes nourish. 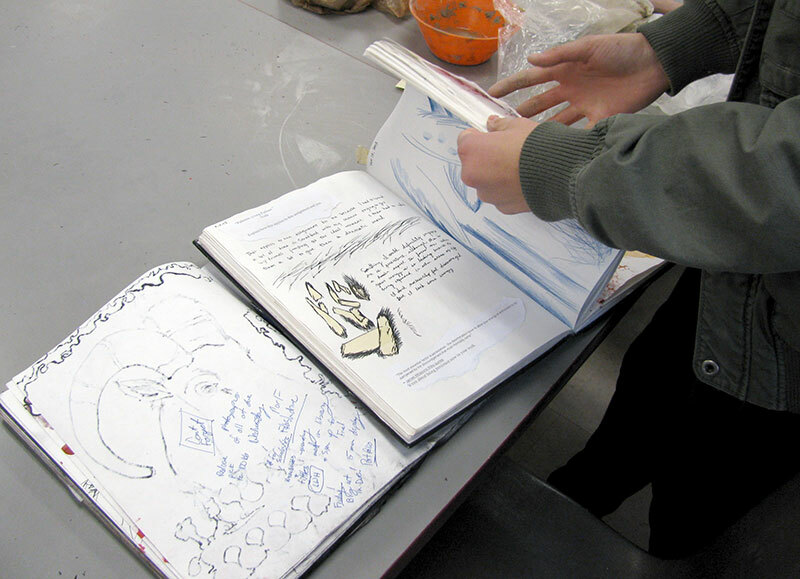 In Cooper’s IB art class, students must complete “investigative workbooks,” sketchbooks that students develop and process ideas through writing, sketches, painting and other mediums. A student flips through her “investigative workbook” for her IB art class. In the investigative workbooks, students create and process ideas. Students pursuing the full diploma must also complete the class Theory of Knowledge, which Younghans described as a class where students think about thinking. In the class, students practice critical thinking, while also examining cultures and bringing together the learning they have done in all other subject courses. Students graduating this next spring with IB diplomas will be the fifth class of IB graduates at GHS. The program has continued to grow each year and, unlike some schools where students may only work towards or a full diploma or that only allow certain students to participate in IB, any students interested in doing the work and improving themselves through IB are welcome to take any classes or pursue the diploma. While many assignments in IB courses are scored by GHS teachers, several, including the end of class exam, is scored by an external IB examiner. In 2013, GHS students scored higher than the international average on the English, Spanish, history, visual arts and music IB exams. In 2010, the first year GHS graduated full diploma students, 10 earned the IB diploma and 123 students took 230 exams. Several students took more than one class, resulting in more than one exam per student. In 2014, there will be 18 full diploma candidates with 182 students registered to take 365 exams. For more information, visit the IB website or this GHS page. On January 7th, the girls freshman basketball team will play John Adams at 7:00 pm. On January 9th, the boys and girls freshman basketball team will play Concord at 7:00 pm. On January 13th, the boys freshman basketball team will play West Noble at 7:00 pm. On January 16th, the boys and girls freshman basketball team will play Warsaw at 7:00 pm. On January 28th, the girls freshman basketball team will play Elkhart Memorial at 7:00 pm. On January 30th, the boys and girls freshman basketball team will play New Prairie at 7:00 pm. In the midst of end-of-the-year exams and projects, Goshen Community Schools students and staff have been collecting goods to help others in the community. Individual schools and clubs within schools have been collecting food for local families who may not have enough to eat and organizing other fundraisers and projects to help other local families. Shelly Banes, a school counselor, has worked at Model Elementary School for 14 years and said that their holiday food drive was established well before she started working there. That food is given to Model families in need with remaining food given to the West Goshen Elementary food pantry, the Window in downtown Goshen and the Salvation Army. It’s a way of saying Model is a part of the Goshen community and helping others in the community, Banes said. This year, Model collected a different type of food item each day for two weeks, bringing in more than 3,000 food items altogether. 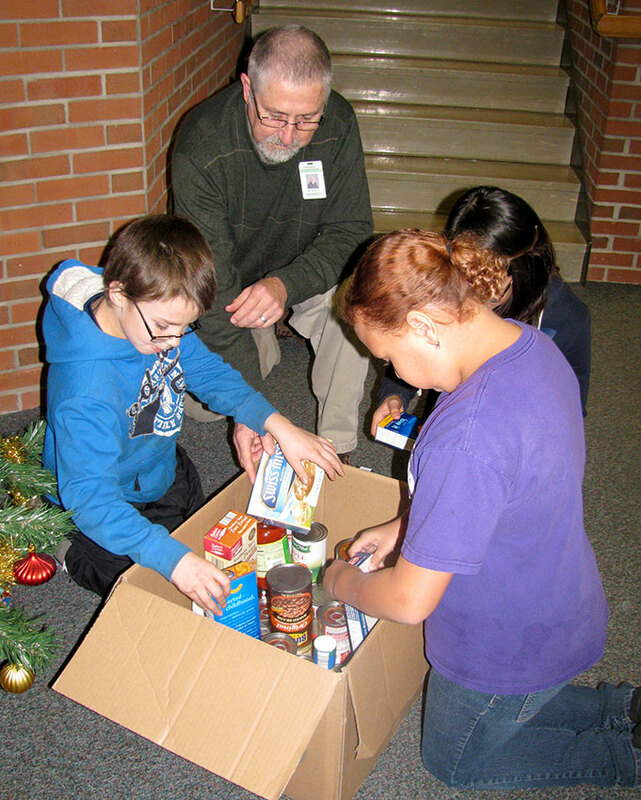 Several schools in the Goshen school system hold their own food drives for families in need, while some work with local pantries to provide for families this time of year, like Chandler Elementary, which has collected food for the food pantry at East Goshen Mennonite Church through the month of December. West Goshen Elementary has a food pantry supported by Sugar Grove Church, with numerous other local churches and community groups donating gloves, hats and other winter gear for families in need. Chamberlain Elementary and Waterford Elementary works with Goshen Middle School to supply families in need with food for the holiday season. Goshen High School holds a school-wide food drive, while individual clubs and groups at GHS hold a multitude of other activities, said GHS Principal Barry Younghans. Many groups volunteer to ring bells and collect money outside stores for the Salvation Army, while others adopt families for Christmas, raising money and buying gifts for families in need. Younghans said those causes also include raising money for the Indiana Organ Procurement Organization and for the Special Olympics, writing answer letters for Santa and helping provide food for the Goshen Middle School food pantry. Goshen Community Schools’ Christmas Break starts Dec. 23. Students return to school Jan. 6. Chandler Elementary Counselor Leon Bauman works with three Chandler fifth graders to box up donated food for East Goshen Mennonite Church’s food pantry. Vote for the Girls Basketball for Team of the Week! 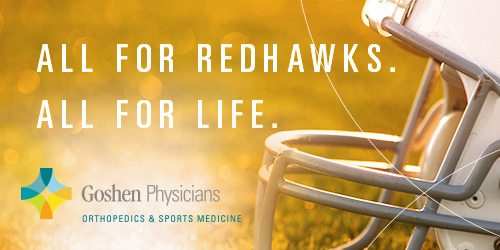 Fans can vote once/day through Wednesday at noon. Congratulations to the girls’ basketball team on this recognition. Other teams nominated are: Lowell, Scottsburg, Tri, and Southwestern Shelby. The boys basketball games between Goshen and DeKalb scheduled for Saturday, 12/14/13 have been postponed due to weather. The games will be played at Goshen High School on Monday, 12/16/13, with the JV playing at 6:15 in the main gym, the freshmen playing at 6:15 in Whiteman Gym, and the varsity game starting 30 minutes after the JV game in the main gym. Admission is $5, KG-Adult to access both gyms throughout the evening. Some Goshen High School students are using cutting edge technology to solve real world problems right in their school. Goshen High School has two 3D printers that the school’s engineering classes and clubs use to create parts. 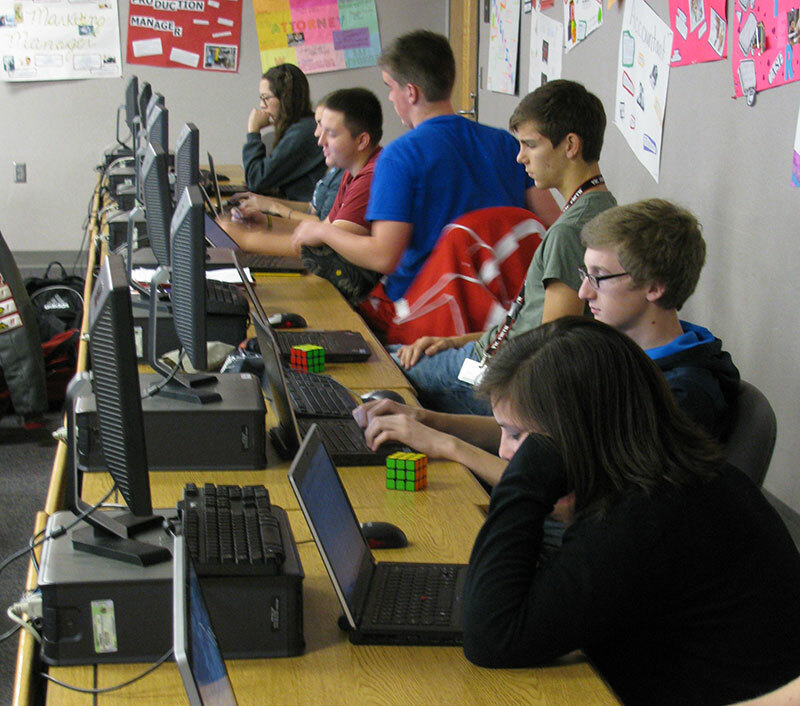 Students use computer-aided design (CAD) software to create a three dimensional model of a particular object. The computer can then be connected to a 3D printer, feeding the machine the information to create the item. The school’s 3D printers release lines of hot plastic to slowly build up the shape of an object. The technology is used in numerous industries today. While students most often use the 3D printers for class assignments or projects, two students recently used the process to help make one Goshen High School students’ life a bit easier. Seniors Evan Smith and Nick Truex were in teacher J.J. Johnson’s classroom one day when one of the school’s paraprofessionals spoke to Johnson about an issue a special needs student was having. That particular student used a gait trainer, a wheeled device similar to a walker, and had received bruises on the back of her legs from her backpack knocking down the fold-out seat on her gait trainer, which would then strike the back of her legs as she walked. 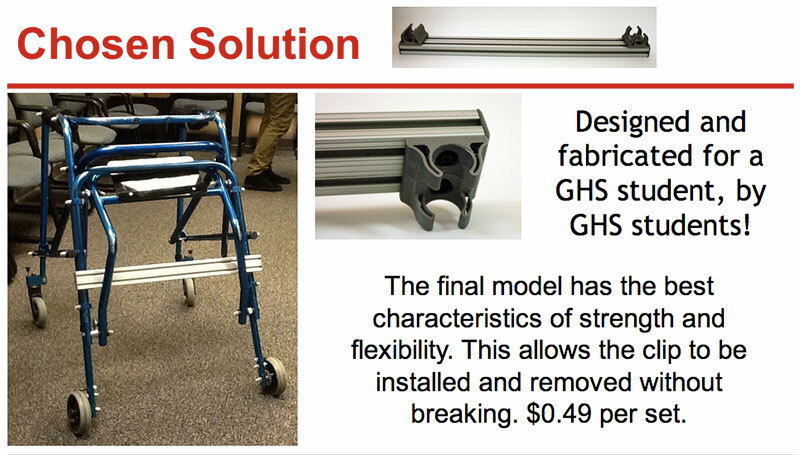 Because Smith and Truex were there at the time, they took on the challenge of designing and creating some way for the student to keep her backpack on her gait trainer without it compromising her movement. The two boys came up with an initial design that same day, Smith said, but continually tweaked and improved it for about two weeks, until settling on their final product. The students designed clips that could be screwed onto either side of the back of a gait trainer and then hold a rod in place. The student’s backpack would then rest against that rod instead of swinging in towards the student’s legs. Smith said that it was fun to be able to work on a project outside of classes or work he does for the high school’s Super Mileage team, which designs energy-efficient vehicles for competitions. “It’s a little more exciting,” Smith said. “You feel more involved with an outside-of-class assignment.” Smith plans to attend Rose-Hulman Institute of Technology in Terre Haute after graduating from GHS to pursue a degree in mechanical engineering. GHS’ wrestling coach, Jim Pickard, had talked with juniors Jonathon Hill and Ryan Meade about how he had photo frames hung on nails that would fall off the walls when people bumped against them. The students went through the design process, developing a piece that now works to hold the photos in their frames steady against the wall. Johnson, a GHS engineering technology teacher, said that he would love to have more 3D printers for students to work with and for more staff to suggest items they could have the engineering students make. “That is going to grow kids’ experience that will also be impactful for them,” he said. The 3D printers are also a major draw for bringing students to the class, he said. Johnson has been able to work with a local company, SeeMe CNC, which builds 3D printers, in bringing the technology into his classes.